You can read his citation below. Nominated by Ken Woolfenden, Great Britain, seconded by Fiona Woolfenden, Great Britain. There are two key reasons for nominating Richard - his work for the International Clematis Society and his enthusiastic promotion and publicity of clematis. Richard's love of clematis started some 20 years ago. In his current garden in Ohio, USA, he has over 250 cultivars. He also grows many other plants. Richard took over collection of membership fees in the USA in 2002, volunteering to do so from Vicki Matthews who was returning to Great Britain. Accurate record keeping is vital to this role and from the start, Richard carried this task out to the highest standards. Dealing with between 50 and 60 memberships each year requires quite a significant effort, but Richard performed it willingly and precisely. In addition, when the USA Customs relaxed the rules over the importation of small quantities of seeds, he again volunteered to handle seed importation and distribution within the USA for the Society. In 2004, when the Society was still discussing whether or not to produce a Membership Leaflet, Richard and his wife, Mahala, at their own expense, designed and produced an International Clematis Society Membership leaflet for the US market. 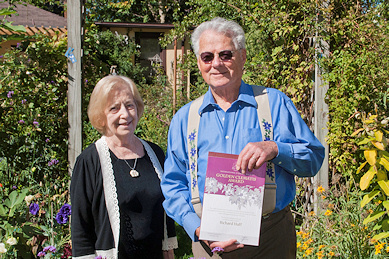 With his wife, Mahala, Richard has done a number of other things, often unannounced and unacknowledged, for example the pressed and laminated clematis flower bookmarks that they made themselves and brought, one for every attendee, to the Cambridge 2004 conference. Richard's work promoting clematis is once again, very understated by himself, but quite wide ranging. He has written articles promoting clematis in local and state-wide publications. He has appeared on TV and radio. He opens his garden to the public and often gives lectures there and elsewhere. The lectures he gives for the State university often include a clematis theme. In summation, Richard Huff is an unsung hero of both the Society and the clematis world, and as such is, in my opinion absolutely the right sort of person to receive a Golden Clematis Award.